Once our customers receive their box of shiny magnets, we're sometimes asked about how to find out which pole is which. Here are a few easy methods to help figure it out. 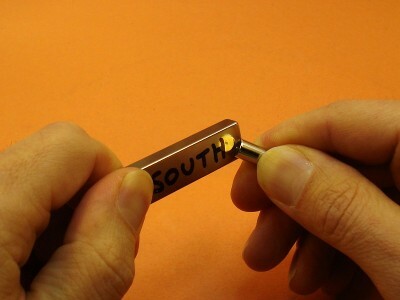 Every magnet has both a North and a South pole. There are no magnets with only one pole (see magnetic monopoles). With an axially magnetized disc magnet, for example, you could write a big N and an S on either round face with a marker. The question is, which is which? When magnets are used in magnetic therapy, the poles are often referred to as being positive or negative. Generally, the South pole is termed positive, and the North negative. This terminology probably stems from trying to model the H-field as analogous to an electric E-field of positive charges, which works under some circumstances. You can find several types of Pole Identifiers available on the K&J Magnetics website. The simplest to use is the Electronic Pole Finder. Simply point the tip at one side of the magnet, press the button, and an LED will light to indicate the polarity, North or South. On a production line, this is your best bet. It works well, consistently, and avoids any confusion. A less expensive option is the D4X0-ND magnet. It has a small dimple on the North end of the cylinder, and can be used to identify the poles on unmarked magnets. The North pole of one magnet will be attracted to the South pole of another -- just remember that opposites attract! If you don't have a pole identifier readily available, you can use a little science to find the North pole of your magnets. Your magnet's North pole is attracted to the Earth's North pole. Technically, the Earth is labeled backwards -- the geographic North pole is actually like the magnetic South pole of a magnet. If you hang a small stack of magnets on a long thread, the magnets will freely rotate. Hang up your 3 foot length of string on a stable platform, like an overhead light. Once it stops wobbling, the North end should be pointing North. If you know roughly which direction is North (the sun rises in the East), you'll find your magnet's North pole. 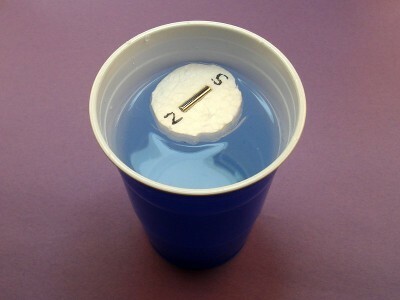 A great science project is to create a compass by floating a magnet on piece of Styrofoam. The lightweight, floating platform gives the magnet a nearly frictionless surface to freely rotate on. The north pole quickly becomes obvious -- plus it's neat to experiment with! This floating compass is a great science project idea for kids. Be sure to include adult supervision with strong magnets. Less interesting to build, but super simple: You can place a disc magnet on it's edge on a smooth surface. If your magnet is sized right to balance this way, it will twist to point North. Simple, but effective. A red and black D68PC-RB magnet near a plain DC2 disc magnet. Which side is the north pole of the unmarked DC2 disc magnet? The south pole of the plastic coated magnet touches the north pole of the disc magnet. The north pole of the plastic coated magnet touches the south pole of the disc magnet. Our D4X0-ND cylinder magnet with a dimple at the north pole has long been a favorite of ours. 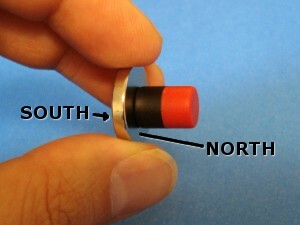 It is a simple tool for identifying the north pole of another neodymium magnet. We recently introduced the two-color, plastic coated D68PC-RB magnets. 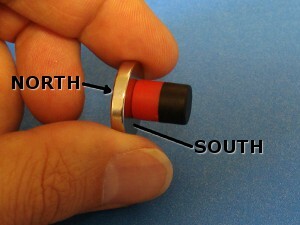 These cylinder magnets are red on the north pole and black on the south. They've become our new favorite pole-identifying magnet. The plastic coating makes it more durable, and won't tend to scratch another magnet. When identifying the pole on larger magnets, this is especially good news. The south pole on the compass points to the north pole of the magnet. The north pole on the compass points to the south pole of the magnet. The north arrow on the compass points to the south pole of the magnet. The south arrow on the compass points to the north pole of the magnet. 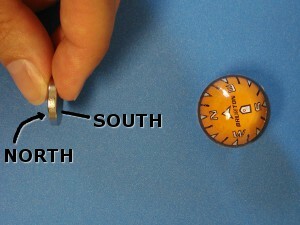 What about using a regular compass that you might have on-hand to identify the poles of your magnets? Remembering which end of the compass points to which pole of the magnet can be confusingy. It is easy to get mixed up. As described in our article, The Earth Is a Magnet, the earth is a big magnet with the magnetic south pole actually located in the north (in northern Canada, currently). 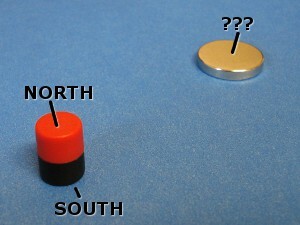 The labeled pictures below should be a good guide to using a compass to identify the poles of your magnets. See the descriptions. Or, remember that they're pointing in the same direction. 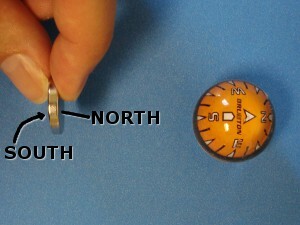 The inexpensive, sphere-shaped compass actually uses a neodymium magnet inside. The traditional needle compass uses a piece of magnetized steel. 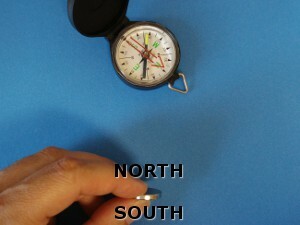 Be careful to avoid getting a neodymium magnet too close to this second type of compass. The powerful magnetic field of a neodymium magnet could demagnetize the needle, or even magnetize it in the opposite direction! Can Magnets Clean Dirty Laundry? Why are Magnets Shaped like Horseshoes? How Much Will a Magnet Hold?